The bow and arrow is one of the most powerful symbols in human history and culture. Nearly every ancient civilization’s mythology has heroes and gods who favored the weapon: Artemis (Greece), Cupid (Rome), Arjuna (India) and Houyi (China). And there are beloved characters from folklore like Robin Hood leading up to more modern bow-wielding characters such as Legolas from Lord of the Rings and Katniss Everdeen from The Hunger Games. It’s no wonder that the two biggest superhero empires, Marvel and DC, both have characters whose primary weapon is the bow and arrow, Hawkeye and Green Arrow. 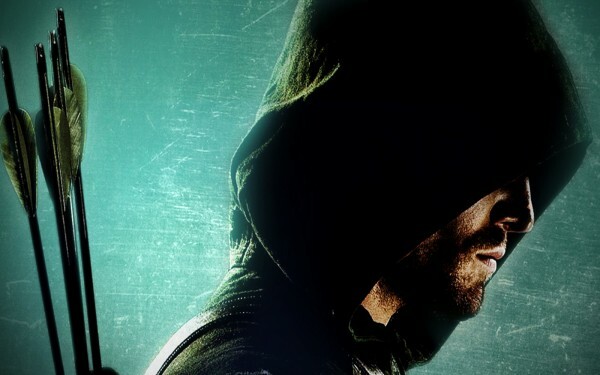 This post looks at the TV series Arrow which adapts the Green Arrow character for the small screen and discusses how, in its first season, it covers a wide range of some of the most important, recurring themes and lessons of superhero mythology. Since I’m covering an entire series here, this post will be longer than usual. To encourage skimming and skipping around, I’ve divided the post into ten “arrow tips.” For the fullest, holistic understanding, however, it’s best to read in order as these arrows are fired off in a logical sequence. One of the central motifs in Arrow is death – namely the death of our hero, Oliver Queen. But it’s not a literal death. It’s a symbolic death in which an old self is immolated and a new self rises in a glorious rebirth/ /transformation. A series of flashbacks throughout the series depicts how Oliver, his father and their friends are on a boating trip when their ship gets caught in a violent storm and is capsized. Trapped at sea in a lifeboat for days, Oliver is the only one of his crew to survive long enough to make it to an island where he will spend his next five, hellish years. Back at home, Oliver is believed dead and even given a tombstone and funeral which represent his symbolic death. Our culture teaches us to associate a sense of dread and despair with death. And while there’s no doubt that death often brings intense emotional pain, this is not necessarily a bad thing. With every death there is always a rebirth of sorts, bringing with it renewal and change (winter unto spring). Death is therefore simply change. In Arrow, Oliver’s symbolic “death” is necessary for the emergence of his new self, one that is much more conscious, alive, wise and at tune with his purpose and mission in life. Go back over your life and recall changes, transitions and “deaths” that at the time might have been tumultuous but, in hindsight, either opened up a new pathway or could have had you been more receptive to the change. Could you adopt an attitude of openness in which future changes and deaths will not be so frightening but, rather, opportunities to be reborn and create a new, better life? Knowledge is the catalyst for Oliver’s symbolic rebirth. Before the shipwreck, he lived a somnambulistic life of nightclubs, girls, fast cars and that’s about it. He had no clue about the dark, festering truth beneath the glossy sheen of his life of luxury, glamor and ease. But while stranded on the lifeboat, his father gives a shocking deathbed confession about the poisonous history of lies and exploitation that was necessary to maintain their lifestyles. This revelation hits Oliver like a bolt of lightning, forever shattering his illusions. This is an ancient, recurring theme in mythology old and new. In the great religious traditions, the symbolic and sometimes literal deaths and rebirths of the central teachers, saints and messiahs signaled the end of a kind of ignorance and the beginning of knowledge and illumination. Sometimes new knowledge triggers the death of your old self; sometimes the death occurs first and brings with it new knowledge. The point is that they often go hand-in-hand just like, in Arrow, Oliver’s father’s confession arrives shortly after the shipwreck. The knowledge I speak of here is any kind of important knowledge that changes your perspective on things. Maybe you went seeking the knowledge; maybe the knowledge came to you unbidden. Imagine you got laid off by a company to whom you were loyal for twenty years. You didn’t know that old-fashioned loyalty could be so little valued by the corporate world nowadays but now you know. Or let’s say you were once blessed with stout health but are now struggling with illness. You didn’t know how precious and sometimes fragile good health can be, but now you do. What will you do with this new knowledge? How will you redefine your priorities? Will you change your patterns or stubbornly cling to old ones? Dig: You really did lose your mind on that island. Oliver: I found some things on the way. Dig: Like what, archery classes? Oliver’s discovery of his family’s secrets combined with the immediate threat to his survival plunges him into the single greatest crisis he’s faced in his life. But a common thread in just about every superhero origin story is that with great crisis comes great opportunity (of which I’ve also written about in my posts on Iron Man and The Dark Knight Rises). The truth is that suffering, if endured wisely, gives you the gift of clarity. Most of us scatter our precious time and energies across too many different desires, pursuits and diversions. The problem is that not only do these diversions not help us get what our hearts desire, they are actually detrimental to the purpose. Diversions, by nature, are pleasurable and too much pleasure, without a measure of suffering to balance it, is an opiate that lulls us to sleep when we need to be vigilantly awake. It leads to complacence and entropy. Like an archer, poised and alert, eyes set firmly on our targets, our minds must be clear and free of extraneous distractions. Sit down and do a meticulous accounting of all the ways you spend your time, energy and money. Investigate and think deeply about whether these things contribute in some way to what’s most important to you or not. Be brutally honest. If they don’t contribute, can you bear to eliminate them? You don’t have to eliminate them all or entirely (we all need some diversions, after all) but if you can’t bring yourself to eliminate at least a good portion of them, it means, unfortunately, that you just haven’t suffered enough yet to really want to change your life. Once you’re miserable enough, you will want to throw away all the foolish distractions that keep you from living the life you want. The dawning of clarity is just the beginning of the journey. Once you know what it is you have to do, then comes the hard part: doing it. For this, you’ll need inner strength for every step of the way. First of all, your period of crisis may be long and protracted. Even though you’ve resolved to change your ways, you still need to wait for the period of darkness to come to an end. Whether you’re trying to find a new job or recover from an addiction, it could take much longer than you’d like. Oliver was trapped on the island for “five years of hell.” Without strength and patience, he wouldn’t have made it. Next, overhauling your life requires strength because even though you may want to change, there may be others around you who have a vested interest in you staying the same. They may surround you with temptations, not out of ill will but out of their own fears and insecurities. In Arrow, the relief and joy of Oliver’s friends and family upon his resurrection quickly turn to confusion and frustration as they can’t understand the change in him. His best friend, Tommy, for instance, is eager to just return to their old glory days of bar-hopping and womanizing. It is a testament to Oliver’s strength and humanity that he doesn’t just coldly cut these people out of his life. Instead, he continues loving them and patiently understanding their confusion and frustration without giving in to their attempts to bring back the old Ollie. In extreme cases, however, a complete severing of ties may in fact be necessary, and that again requires great strength of will. The good news is that we’re all stronger than we think. But the sense of disempowerment is so deeply ingrained that it can take nothing less than a full-blown crisis to change it. This is another gift of acute suffering. You don’t know how strong you are until, as with Oliver, you have no choice but to be. The will to survive is one of the strongest forces in nature and we can tap into this natural reservoir of strength even in situations that don’t literally involve physical survival. Every time you feel like you’re not strong enough to do something in your life, which will be often, stop and imagine how your very survival might be at stake. It’s not the survival of your body but the survival of your dream that’s at stake, which is equally important because a life without a dream is a life as good as dead. As long as your desire to create a life worth living is raw and primal enough, you’ll psychologically trigger your body’s natural, inherent survival mechanism which taps into every internal resource you have. Every neural transmission, every ounce of mitochondrial energy, is diverted from frivolous activities into only the most important ones. But for this to work you have to first cut out dispensable thoughts, desires and activities (again, clarity). Why? Because we fret, worry and stress about the smallest things day in and day out, unwittingly sapping our overworked sympathetic nervous systems. Then, when faced with a bona fide crisis, we don’t have the physical, mental and emotional energy reserves to overcome it. Another thing you can do when you don’t feel strong enough is stop and ask yourself: “Am I dead yet?” And if you’re even asking yourself that, it means you still have some strength left in you. You can still do something, however small. And by doing small (but important) things again and again, one day at a time, you will eventually liberate yourself. This is how Tony Stark frees himself from the cave in Iron Man; how Bruce Wayne frees himself from the prison in The Dark Knight Rises; and how, in Arrow, Oliver Queen frees himself from the island. Atonement with the Father is another one of the archetypal stages of the Hero’s Journey. Complex and multi-faceted stage, it’s a stage that can be depicted and interpreted in different ways. Often, it involves the hero somehow righting the wrongs done by the father or done to the father – sometimes both. We can see elements of all these in Iron Man, the Dark Knight trilogy and the Hulk movies to various degrees. One of the most famous examples in popular culture is, of course, Luke Skywalker’s relationship with Darth Vader. Vader is not just Luke’s biological father but he also represents the Empire, political corruption, the abuse of power and Luke’s own potential for the Dark Side. The “Father” can be anyone or anything that has made your physical, cultural, social and psychological selves. It can be an institution or even an abstract concept. Your social and cultural backgrounds are your Fathers. Your religion, or lack thereof, is your Father. The company you work for is your Father. You get the idea. Oliver Queen’s Father archetypes are also multi-layered in this way. On one level, it’s his biological dad. On another level, it’s the corrupt and selfish values that his father, before he repented, lived by. It’s the corporate institutions and infrastructures that his father built and supported. It was the whole lifestyle that Oliver lived before his shipwreck and ensuing crisis. The entire Arrow TV series is about Oliver atoning, arrow by arrow, episode by episode, for the sins of both his literal and figurative fathers. Who and what are the “Fathers” that have made you? What are their sins? Remember that this is symbolic so that even if you never knew your biological dad you still have many Fathers. Of course, our Fathers have good things about them but there will inevitably be some bad things too – “sins.” Think about how those sins might be somehow linked to the problems in your own life, even if you can’t see how at first. This isn’t for the sake of blame but for seeing the interconnectedness of all things, how the actions of others affect us and how our own actions, in turn, also affect everything around us. We are all responsible for everything in some way. But remember that only action rooted in love, not hate, can truly create lasting change. Luke Skywalker, for example, after recovering from his initial shock, did not disavow himself from his father. Instead, he lovingly did everything he could to bring Vader back into the light. Had he fought back with hate, he would surely have been turned to the Dark Side. Numerous characters in Arrow struggle with the death of their old selves and the birth of new ones and then struggle to not let their past define them. Oliver, of course, is the primary example of this in the series but his partner, his best friend and one of his love interests all go through the same thing in different ways. It doesn’t matter how seemingly exalted or low, pure or corrupt, your past and background details may seem. They do not ultimately define who you are. Only the actions you choose to make each and every day do. If Oliver did not believe this then he could not be Green Arrow. He would just resign himself to being a billionaire slacker or the heir to a corrupt empire. But he renounces that past forever and, despite still being rich, doesn’t identify himself with his money. The money is nothing more than a tool to be used. It helps but even without it he would still do what he does. If you truly want to grow and be empowered, forget everything about your past. Ignore even your job title, nationality, political affiliation, religion, alma mater, all of the things that people proudly latch onto for identity but actually limits them. The only thing that really makes who you are is what you choose to do in your situation, day by day, moment to moment. You could be a billionaire who graduated from Harvard and still be a loser at heart. You could also be a gas station attendant who never went to college and still be a superhero. Oliver knows that even with the sum of his combat skills, intelligence and immense resources, he still can’t take on all of Starling City’s problems. So he chooses his battles with discrimination and precision. In episode 6, when his partner Dig suggests going after a team of bank robbers, Oliver flatly refuses, explaining that street crime is beyond his target range. Corporate crime and corruption are his focus. Rather than callous insensitivity, Oliver’s response is actually shrewd and practical. Often, what detracts from our efforts more than anything is the uncontrolled impulse to fight too many battles. And while the desire to right all of the world’s wrongs is a noble one, from a realistic standpoint it is counterproductive. It is supremely difficult to make significant progress in even just one crusade or mission. You have to choose, therefore, and there’s no way around it. When you feel tempted to take on too many things, take refuge in the knowledge that everything is so interconnected that if you manage to do some good in even just one or two causes, the ripple effects will affect everything else. Oliver: I’m trying to teach you something. Helena: What, the least effective way to shoot people? Oliver: Control. To use a bow and arrow requires discipline and patience. It’s not enough to decide which targets to focus on. You have to also decide which instruments to use and specialize in. Obviously, in Oliver’s case, his primary instrument is the bow and arrow. As always, with any superhero mythology, if we’re to go beyond the level of mere entertainment, we can’t take things literally. In real life, one guy armed only with a bow and arrow, however well-trained, isn’t always going to fare well against a whole gang of thugs armed with submachine guns. What the fights scenes between Oliver, with his primitive weapon, against so many bad guys armed with awesome firepower represent is the power and effect that a single individual can have despite facing formidable odds if he can choose both his targets and his instrument wisely. For example, imagine an independent environmental journalist. She wants to crusade against corporate practices that lead to environmental degradation. If she takes on the corporate machine head-on she will lose. The industry has vastly more resources – entire teams of publicists, scientists and lawyers who will rip her apart. But let’s say she chooses her target selectively by focusing her efforts on a single, local corporation whose business practices do harm in some way to the ecosystem of her town and the health of the people living there. She then chooses her instrument, writing, specifically her blog, and focuses on extensively documenting the history and malpractices of this company on the blog. Through hard work, luck and perseverance the blog gradually attracts a sizable audience who become shocked and outraged at what they read about. This alone won’t take down the whole company or transform its corporate culture, but it will have played a role and that’s as much as anyone can hope to do. Another common element of all the superheroes I’ve talked about on this blog is failure. In episodes 9 and 10, after a string of victories, Oliver has his first major failure and falls into a subsequent slump. Let’s say that after years of uncertainty and lack of direction you’ve finally found your way. You’ve discovered a purpose in life and even found some success with it. Sooner or later, there will be another crisis. You will run into setbacks, have failures, fall into a slump or lose direction again. Whatever the reason for it, occasional failure itself is completely natural and normal and the better you’re able to accept it, the more your mind will be at peace when it happens and the sooner you will recover from it. Like any superhero worth his salt, Oliver comes home late, is rarely home and is distracted even when he is. He doesn’t show up to events he promises to attend and, even if he does show up, abruptly disappears in the middle of it. All part of the business of being a hero. Defining a cause, purpose or mission in life and fighting for that cause adds all kinds of burdens on your life, but one of the hardest burdens, as you shall see if you haven’t already, is the strain to your relationships. Balancing the needs of the people you love and the demands of your calling can exhaust any superhero. In Arrow, we see how Oliver’s struggle to maintain the integrity of his relationships is just as much of a challenge, if not more, as his crusade against crime. Because of this, personal relationships may feel like weighty attachments that take away your edge, but actually they make our battles worth fighting in the end. When, before his death, Oliver’s father begs him to right his wrongs, Oliver only promises to do so because he loves his father so much. Without that emotional connection, there wouldn’t be enough motivation to risk his life to fight crime. And so even as your relationships compete with your life’s work for your attention, try to honor and celebrate the people you love as one of the reasons you are doing that work to begin with.